Copyright 2014 McLeod.This is an Open Access article distributed under the terms of the Creative Commons‐Attribution- NonCommercial-ShareAlike License 4.0 International (http://creativecommons.org/licenses/by-nc-sa/4.0/), which permits unrestricted use, distribution, and reproduction in any medium, provided the original work is properly attributed, not used for commercial purposes, and if transformed, the resulting work is redistributed under the same or similar license to this one. A key concern for qualitative inquiry is finding ways to account for nonhuman and emergent forms of life. Toward this, researchers are experimenting with research practices that decenter the human subject. Deleuze’s (1977) assemblage concept has proved a useful resource for these methodological experiments. Most often, the assemblage concept has informed analysis and writing processes. This article puts the assemblage concept to work during each stage of an empirical research project exploring how people experience antidepressant use. It details seven ways that assemblages are used during concrete research processes across the span of the project. This strategy generates a sensibility toward qualitative inquiry described as orientating to assembling. The sensibility decenters the human as the focus of qualitative research. It enables the presence of nonhuman objects, not as acted-upon, but agents in the research processes. The article contributes to the challenges posed to human-centered qualitative research by reframing the focus entirely. 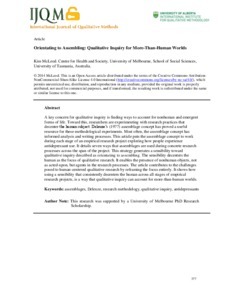 It shows how using a sensibility that consistently decenters the human across all stages of empirical research projects, is a way that qualitative inquiry can account for more-than-human worlds.